You have slogged your back off in the last six weeks and have just received a coveted job offer. You are ecstatic. But your happiness is limited as within a day you receive a mail from the company stating that your job offer has been rescinded. You are aghast and angry as you realize that your dream has been shattered and all your hard work has gone to waste. You even think of suing the company. But wait for a few minutes and calm yourself before you plan out the strategy to take against the company. It is also vital here that you understand in detail regarding a few facts regarding rescinding a job offer. Is Your Job Offer a Legal Contract? 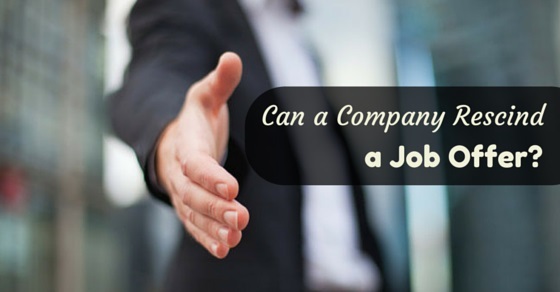 Media Bistro in his article” Can a company legally rescind a job offer?” explains the fact that when you accept a job offer it is based on the doctrine of employment at will. Thus there are various terms and conditions using which the employer can retract the job offer. But these conditions should not be used in a discriminatory manner and being based on the personal opinion of the person. Here you have to understand that the job offer was retracted because you might have had some problems in your background checking or it could be due to a poor background credit card history also. Have you been discriminated by your employer? If you feel that an employer has retracted your job offer and you are being discriminated on the basis of your race, caste, religion or even your gender, you can undertake legal action. USA has strong anti-discrimination laws and the candidate can sue the company if he has proof of this. Have you received misinterpretation regarding the job opportunity or the company in any ways? There have been many instances where the candidate has resigned from the company and is all ready to join the new job opportunity. And if he receives a mail that the company is moving to another location and the job offer has been rescinded. In such a case the candidate can issue a legal notice stating that the company was aware of the location change but still asked the candidate to quit his last job and now has retracted the job offer. Here the employee might ask for a legible compensation. When a company or an employee does not follow the outlined terms and condition mentioned in the employment contract, then a breach of contract occurs. For example if the employer can show that he has been asked to work beyond the specified working hours on a regular basis and has also not received any extra compensation in this regard, then the company can be sued. When a project has been scrapped or postponed? There have been many instances where the employer has retracted a job offer since the project was postponed or scratched off. Here the employer would not want to undertake additional financial loss by on boarding a senior candidate who would draw a heft monthly salary. So the HR does the dirty work of retracting the job offer and then speaking to the candidate that the offer would be reinstated once the project is activated again after a few months. Another example would be employing freshers for next year. But if the company faces low business returns in this year and the projected financial budget is limited, the freshers would not be recruited at all. Does the candidate have a poor credit rating or a criminal history? In many instances a company is forced to rescind offer of employment when they find out that the candidate has poor credit ratings or has a criminal history behind him. Since the job responsibility would involve a lot of financial transaction, the employer considers the candidate to be a liability and he thus retracts the offer. Is it a reality which needs to be accepted? Mimi Moore an expert working at Bryan Cave LLP explains that revocation of offer is a reality in the current economy. Most candidates do not understand that jobs are being revoked in large numbers as the company is downsizing in a major way and the company budget is being shrunk too. Moore further states that in the current state of economy fewer jobs are going to be offered and among the job offered to candidates, a small percentage of it might be revoked. This risk is higher among low level executives as they are recruited much earlier than senior candidates. Since a few months are in between the time the candidate was hired and his date of joining, the company’s needs can change and thus the offers can be revoked. How to Deal When a Company Rescind a Job Offer?? During acceptance of job offer where you would need to join after a few months, it is essential that you keep on looking for new job opportunities which have immediate date of joining. Here after accepting the offer you would need to undertake a research where you understand the financial condition of the company. Once you start asking questions and reading important reports, you would understand whether the job offer would be revoked or not and this would also help you to draw a backup plan if an exigency condition develops in the near future. Many companies offer signing bonuses when a position is important and there is a scarcity of skilled people. But sometimes these positions get revoked also. Thus when accepting job offer negotiate on the signing bonuses and this would help you in some ways, if the job offer gets revoked in the near future. When you are being offered a job at Chicago, you have to relocate from Seattle in a matter of two months. However if your job gets revoked due to various reasons, you should get the relocation expenses as you have spent it. Can the candidate ask a few questions to analyze whether the job could be revoked or not? What is the current strength of the department? What is the candidate turnover level in the department? How long have these people working in this department? If the department has been formed recently then chances of job offers being revoked is high. How many people are they hiring currently? What are the different positions they are hiring? What is the general date of joining for these candidates? Is there any chance for the job offer to be revoked? If the job is rescinded then what course of action would be taken by the company? Here the company can pay a small stipend for a month for candidate whose job has been revoked. In some cases the candidate might also be referred to other candidates. 1. Most job offers are based on the doctrine of employment at will. Thus company’s can revoke the job offer anytime. 2. A job offer is revoked mostly between the period he is offered and the time he joins the company. Thus accept offers which have early confirmed date of joining. 3. Job seekers do not understand the fact that job offers can be rescinded. 4. Higher level jobs are at greater risk to be evoked then lower level jobs. 5. Freshers are more susceptible when it comes to job being revoked. 6. Employers revoke a job offer when they find that their business is running at a loss. 7. If the candidate has a confirmed bad background check his offer can be rescinded. 8. It is difficult to prove in court when you are suing your employer as the job has been revoked. 9. A good employer will go out of the way to help you find the right job. If your current job offer has been revoked the best thing to do here is to start looking for a job again. There is no use in feeling bad and pondering over the injustice which has been meted against you. You have to understand that it is a reality of life which you have to accept and move on. In certain cases you might land up with a better job opportunity and thank your stars that your other offer had got revoked earlier. Otherwise you would not have received this current job offer which has improved your career growth in a considerable manner.